I've always had a fascination with bustards, those strange, gangly, and long-necked birds of the Old World grasslands. 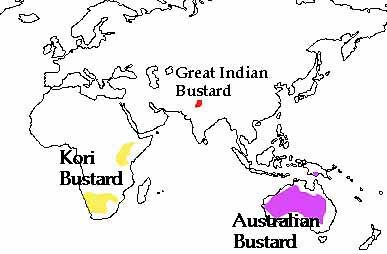 And among the bustards are three huge ones in the genus Ardeotis: the Kori Bustard A. kori of Africa, the Australian Bustard A. australis of Australasia (left), and the Great Indian Bustard A. nigriceps of the Indian subcontinent. Each stands up to 3.5 ft tall and can weigh up to 30 pounds -- these are just HUGE birds. [The one other species in the genus, Arabian Bustard A. arabs, is very interesting in its own right but is decidedly smaller.] These three big bustards resemble each other closely. Indeed, from an amateur geographer's point of view, it seems obvious that they must have had the same ancestor that ranged from Africa to Australia in some long ago era only to become isolated by major environmental changes. They now exist in three widely separated grasslands as shown on the map below. Because they are such big birds, they require substantial wild habitat to survive. All have declined with fragmentation of arid grasslands. [My naive "obvious" viewpoint may not be correct; according to Collar (1996) it is nigriceps and australis that are closely related with kori more aligned with arabs than with the other two.] In any event, I've always wanted to be able to say I'd observed all three in the wild. Now, after a March 2001 trip to India, I can finally do so. And now I can finally show photos of these three great big bustards side by side (L to R: Kori, Indian, Australian). None of the three species was particularly easy to find, although only the Great Indian Bustard is an endangered species. 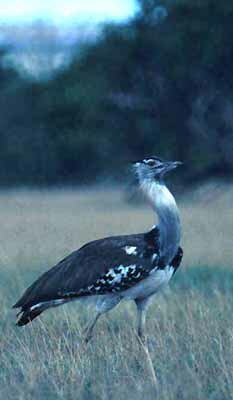 While the Kori Bustard is widespread in east and south Africa, it is spread rather thinly through the habitat. You look for it in the great game parks on the African savanna full of zebra, gnus, antelope, and lions. In three weeks in Kenya back in November 1981, we saw only single individuals in Amboseli and Tsavo West parks. Likewise, the Australian Bustard has a huge range in the interior of Australia and in southern New Guinea, but I've seen it at only two sites on the dry side of the Atherton Tablelands in Queensland, and four birds in the remote grasslands on Wasur National Park, Irian Jaya, New Guinea. Each experience was memorable. Watching these big brutes stride across the wide expanses is dramatic, and they look like B52s in lumbering flight. 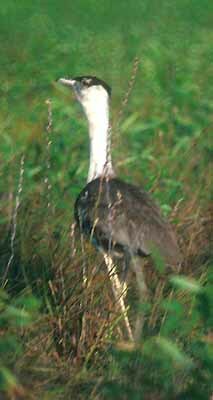 The Great Indian Bustard is classified as Endangered because of its very small, declining population, a result of hunting and continuing agricultural development (Birdlife International 2000). It has entirely disappeared from five Indian and Pakistani states, and less than 20 birds remain in four other Indian states. Only tiny populations (<100) exist in Andhra Pradesh and Maharashtra, so the last stronghold of the species is in the arid semi-desert of extreme western Rajasthan, India. 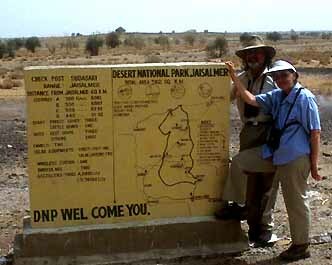 The largest protected area set aside for this highlight bird is Desert National Park (left; that's Rita Carratello and me posing at the entrance sign). That population is estimated at perhaps 500 bustards. Their ecology has been studied here to some extent, and there are rangers to try to protect the reserve from poaching. 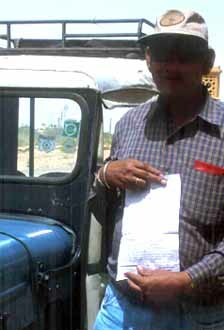 It is a two hour drive by jeep from Jaisalmer to Desert Nat'l Park, so we got an early start. Unlike the rest of India where the roads are crowded with buses, bicycles, camel carts, and herds of goats and it takes forever to get anywhere, the roads here have almost no traffic because of the military restrictions. The road is also nicely paved for some distance (again, for army reasons) and one most check in at the police station at Sam at about the halfway point. From there the road is a broad dirt track running south to the park. We were greeted by very helpful park staff who reside in mud huts baked hard in the desert sun. The habitat stretches out to the horizon in all directions but the best habitat is looking back to the east (photo below top) where a huge swathe of semi-desert has been surrounded by a fence to keep out cattle. One arranges with the local wardens to be escorted on a walk into the desert looking for the Great Indian Bustards (below bottom). Although setting aside reserves and reducing poaching has helped the Great Indian Bustard, more effort is needed. The birds undergo nomadic movements -- sometimes for quite a distance -- in response to a variety of factors that are not well understood. The habitat itself is fragile and drought is a recurring problem. Great Indian Bustards can breed at any time of year but it is usually initiated by the start of the rains. Those annual rains are thus important to population stability. While we were there, the staff seemed very intent on protecting these magnificent birds and we left with a feeling of hope. Political instability remains a feature of subcontinental politics, of course, and these birds on the Pakistan border are in a particularly flammable locale. We felt fortunate to enjoy our experiences and can only hope for their continued existence in the future. PHOTOS: The Kori Bustard was photographed in Amboseli Nat'l Park, Kenya, in Nov 1981. 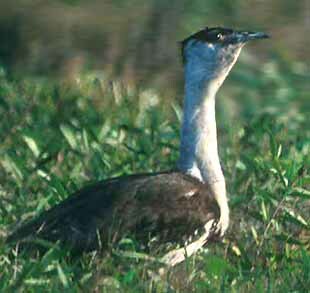 The Australian Bustard photos are from Wasur Nat'l Park, Irian Jaya, New Guinea, in July 1994. 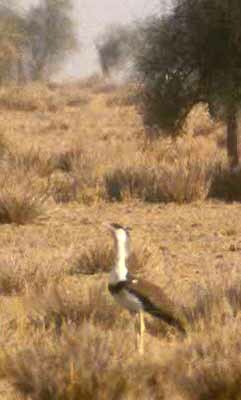 The Great Indian Bustards and habitat shots are from Desert Nat'l Park, Rajasthan, India, in March 2001. All photos are © 2001 Don Roberson; all rights reserved. Collar, N. J. 1996. Family Otididae (Bustards). Pp. 240-275 in del Hoyo, J., Elliott, A., & Sargatal, J., eds. Handbook of the Birds of the World. Vol. 3. Lynx Edicions, Barcelona. Kazmierczak, K., and R. Singh. 1998. A Birdwatchers' Guide to India. Prion Ltd., Sandy, U.K.